From the Publisher: Donna J. Shepherd’s snappy rhymes along with the 15 colorful and fun illustrations by Kevin Scott Collier help children see the need to protect their skin in the sun. Sun Safety Tips in the back of the book reinforce the book’s theme. 27 pages. 94 word easy reader. Kandice on CafeMom has a great list of rules to follow for fun in the sun. CLICK HERE! Apple Cider Vinegar: Apply apple cider vinegar to the burn with a cottonball, or make a cooling compress for a large area to relieve the pain. Keep the skin moistened. This remedy will prevent blistering and peeling. With my children, I filled the bathtub with tepid water and poured a small bottle of vinegar for the kids to soak in for about 20 minutes. No More Gunk! is a Double Doozie - two books in one! This book is the first for a new imprint of Guardian Angel Publishing. The Health & Hygiene line features books teaching children about taking care of their bodies. In No More Gunk! by Donna J. Shepherd, short, playful rhymes and Kevin Scott Collier's humorous illustrations help children learn in a fun way the importance of proper dental hygiene. Tooth Tips encourage children to take care of their teeth. In the bonus book, Ouch! Sunburn!, Donna J. Shepherd's snappy rhymes, along with the 15 colorful and fun illustrations by Kevin Scott Collier, help children see the need to protect their skin in the sun. Sun Safety Tips in the back of the book reinforce the book's theme. Click HERE to order directly from Guardian Angel Publishing. 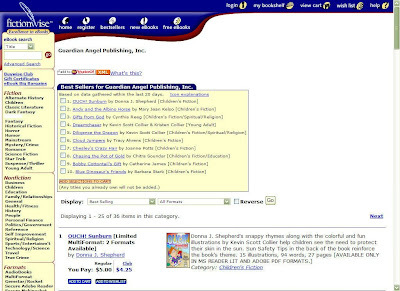 PUBLISHED BY: Guardian Angel Publishing (Health & Hygiene Children's Book) DOUBLE DOOZIE – TWO BOOKS IN ONE! "This is a fun "book" to review since it is actually two books in one! Guardian Angel Publishing has come out with their Double Doozie line of books and now has a Health & Hygiene Line. In NO MORE GUNK, author Donna Shepherd has written a very humorous yet factual storyline on taking good care of your teeth and how to do so, in rhyming prose. Combined with the awesome and very funny artwork of Kevin Scott Collier, this book is quite the attention-getter for your child and will help you to teach him/her good health habits in a really fun way. I particularly enjoyed the "No More Gunk Tooth Tips" at the end of the story – even the tips rhymed! Good job, Donna! My favorite tip: "They're your teeth, so be the boss. Always take the time to floss." This was like reading a terrific poem full of FUNNY illustrations that your child will want you to read to them over and over and over! This is a keeper and gets a high five, especially when coupled with a SECOND free book! OUCH! SUNBURN is also a terrific learning experience for your child, and one that hit home hard to me personally. Back in the age of the dinosaur, aka - when I was a small child, we didn't know much about the dangers of the sun and how it damages your skin, and nobody knew what sunscreen was. I grew up by the ocean, so I was either always at the beach, or at our local pool where I swam competitively. I am blonde and fair-skinned, and I had some whopper sunburns as I grew up. I've been "out of the sun" for 40 years now, but it doesn't matter – I still ended up getting skin cancer from those early exposures as a child. So, I can tell you firsthand, that everything Donna says in this book is absolutely positively the truth, and I hope its message really hits home to young readers. The charming rhyming prose Donna uses along with Kevin's fun, colorful illustrations, make this book lots of fun for children to learn how to protect their skin from sunburns. At the end, Donna again gives Ouch! Sunburn Extra Tips, of course, in rhyme. My favorite: "When you're out from ten to two. Play in Shade. Smart Kids do." WHERE WAS THIS BOOK WHEN I WAS GROWING UP? This is a must-have to teach your child safety in the sun at an early age. A new review just went up on Reviews by Heidi for No More Gunk! & OUCH! Sunburn. Thanks, Heidi! Trailer - No More Gunk & OUCH! Sunburn! Coloring Page for the Kids! A new coloring page by Kevin with the little boy from Ouch! Sunburn! Uh-oh! It looks like he might be falling asleep in the sun. That's a no-no! Right? OUCH! Sunburn is #1 on the list! We're on the Bestseller List on Fictionwise! Now you can find Ouch! Sunburn!, along with all the other wonderful books from Guardian Angel Publishing for sale at FictionWise, "the Internet's most comprehensive collection of fiction (and yes nonfiction too!) in the most popular eBook formats." Here's the link for all the GAP books. Click HERE. FictionWise has a special reduced price on the GAP books for a limited time. Only $4.25. For Ouch! Sunburn!, click HERE! Here are some other tips to protect your child from the damaging effects of the sun and for prevention of sunburns. Kevin, illustrator of the book, Topsy Turvy Land, drew this coloring page featuring the boy in our newest eBook, Ouch! Sunburn! Enjoy! Sparkles, the Fire Safety Dog has been credited with saving several lives! 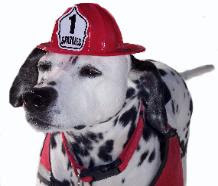 Her Momma Dayna is a firefighter and wrote a book about her dog, too. In the book, children learn of the adventures of Sparkles, the Fire Safety Dog and valuable fire safety tips enabling them and their families to keep fire safe. These tips include recognizing the firefighter as a helper and a friend, knowing the sound and purpose of a smoke alarm, learning how to crawl low under smoke, and understanding the importance of practicing a home fire drill using an escape map. Ahd she even has a video that tells all about her! To read more about Sparkles, visit Dayna's blog at http://www.childrensbookauthordaynahilton.blogspot.com/ There you'll find a word search puzzle, coloring pages, more videos, and a hidden picture puzzle, too! Have fun! Click on Pic to Visit Topsy Turvy Land! Click on Angel to read an in-depth interview with Guardian Angel Publishing founder, Lynda S. Burch.